Gilchrist at his first dealership. Texan Charlie Gilchrist, the incoming 2019 chairman of the National Automobile Dealers Assn., started in the business as a controller for a heavy-truck store. He now is president of Gilchrist Automotive. Covering the Dallas-Ft. Worth metroplex, the dealer group consists of outlets representing Ford, Chevrolet, Buick, GMC, Nissan, Volkswagen, Mitsubishi and Chrysler, Dodge, Ram and Jeep. In a Wards Q&A, Gilchrist discusses industry issues, vehicle affordability, his plans as NADA chairman, his take on some of the brands he represents, EV sales, doing business in Texas and learning from mistakes. Wards: What are big issues for NADA this year? Gilchrist: Number one, we have a huge affordability issue for new vehicles. 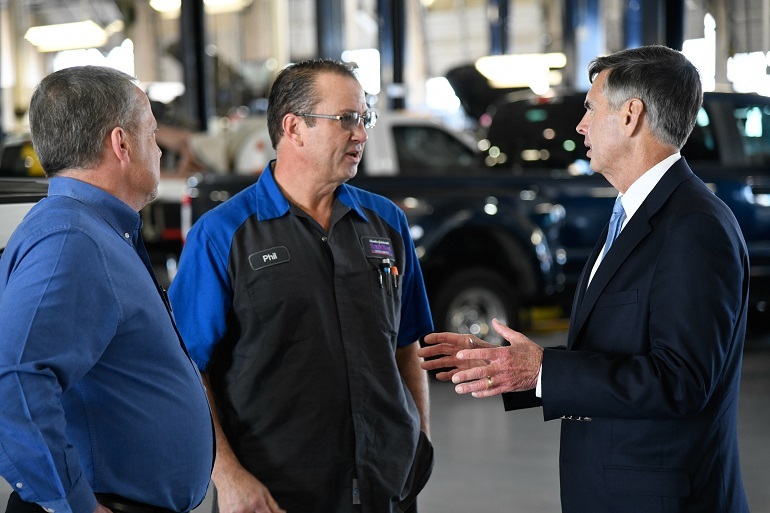 We need to make sure new vehicles, especially with all the new technology and safety features that are being added to them, remain affordable for all of our customers. The affordability issue really permeates everything we do. We also have to look at the way our business model is changing, particularly with the pressure being put on our new-vehicle departments. And we have to work with each OEM and figure out how to make our new-vehicle departments viable and sustainable over the long term. Wards: As the 2019 chairman, what will you be concentrating on the most that’s near and dear to you? Gilchrist: I want to get every dealer involved in NADA, and I want every dealer to feel like they are NADA. I want them to help us achieve the goals that we have as an organization and as an industry. And part of being involved in NADA means challenging us. I’m a big believer in the importance of working on self-improvement every single day. It’s one of the five core values that make up the Gilchrist Difference, which is what sets us apart from other dealerships. I want that to be a part of my chairmanship. The second issue is our dealership workforce. Our people are everything to us. They’re the most important part of the equation to us as dealers. We need to have the best people, so we need to figure out how to recruit, train and retain the best people. But we’re facing a shortage of 76,000 technicians each year between now and 2026. And there are about 30,000 technicians that will be retiring during that period, so the shortage we’re facing is only going to get worse. Closing that gap will be a major, major focus of NADA in the coming years. And through NADA and the NADA Foundation, we’re launching a workforce initiative to help recruit and train the future technicians of our industry. Wards: It’s understandable why dealers who sell a lot of imported vehicles would oppose automotive tariffs, but what about the dealers who sell many domestic vehicles, dealers like you? Should you or they care about tariffs? It wouldn’t seem like they have a dog in the fight. Gilchrist: Of course they should care. They need to care, and they do care. And the reason is that no vehicle sold in the U.S. is 100% domestic. Today’s auto manufacturing and assembly industry and its supply chain is both global and complex. In fact, vehicles that are assembled in the U.S. have a U.S.-made parts content of, on average across the industry, only 60%. Meaning that every single American-made car and truck is partially an import. So tariffs on autos and auto parts would affect every make and model sold in the U.S., and result in higher prices for all vehicles, making this an issue that affects the entire industry. On top of that, parts used for service repairs may be imports as well, and if those are subject to a tariff, it would result in higher service costs being passed down to the customers of every dealership. Wards: What is the Dallas-Fort Worth market like? How is it different from other markets? How is it the same? Gilchrist: Well, it’s a pickup-rich area, and we have great pickups that we represent. So we’re fortunate we’re able to sell so many great vehicles to meet the needs and desires of so many of our customers. The other way it’s like other markets is we’ve seen the dwindling down of the sedan market like we have nationally for a few years now. Sedans are now making up only about 30% of the total new-vehicle market nationally, and North Texas is certainly part of that trend. Wards: Your franchises include Ford and General Motors. Are those automakers making the right moves by cutting back on car making? Or are they going too far, particularly Ford, which will have one car left (the Mustang) if all goes according to plan? We just have to make sure these vehicles are affordable. While we’re making vehicles that our customers want, we have to have entry-level vehicles for our customers, whether they’re CUVs or SUVs. The affordability issue really comes into play here. We have to work with each one of our manufacturers to make sure we have those entry-level, affordable vehicles regardless of what they’re called. Because having those vehicles is so critical to bringing first-time customers into our family and being able to grow alongside them as they advance in their careers, have families and need to step-up to other vehicles. Wards: You also represent Volkswagen, which has made a big commitment to producing electric vehicles. What about VW’s ambitious EV push? Will it play in Dallas or anywhere in America for that matter, considering EV market share is less than 2% right now? Gilchrist: It’s not just Volkswagen. I think everybody wants to and is serious about building electric vehicles. And that’s great because there is definitely a big place for electric vehicles, and hopefully eventually in every market. And dealers absolutely want to sell electric vehicles. Two of the biggest hurdles we still have to clear are recharging speed and recharging access. The Wards December 2018 Big Story was right on the money in this regard, asking the critical question: Where and how fast will these electric vehicles recharge? The cars themselves have gotten much better in terms of range between charges, but recharging speed still gives people anxiety, as does recharging access. That’s true everywhere, but when you think about a place like Texas, how do you tell a customer that a vehicle is right for them if it can go 250 miles (400 km) between charges, but that customer regularly drives 500 miles (800 km) or 900 miles (1,440 km) and there’s no recharging infrastructure along the way? These are real-world scenarios, and until we have better answers for customers, we won’t see big jumps in electric vehicle sales. Wards: Some surveys indicate more EVs would be sold if dealership salespeople didn’t steer people expressing an interest in EVs to more conventional vehicles in stock. What are your thoughts on the claim that dealers are more or less undermining potential EV sales? Gilchrist: I’ve seen those surveys. First, they aren’t scientific, and the authors acknowledge that. But more to the point, I don’t think they’re at all reflective of what’s going on in the market. I have a Nissan store so we’ve been selling electric vehicles in Texas for years now. We want to sell what our customers want. And if our customers want to buy electric vehicles, we want to sell them electric vehicles – and we do. But to the example I just used, if a customer has an interest in an electric vehicle, but then asks me how long it’s going to take to recharge, or how many recharging stations there are between Dallas and El Paso, am I not supposed to answer honestly? And if I do answer honestly, would that be considered “steering” that customer toward a vehicle with a gasoline engine? These are the scenarios these survey authors just completely gloss over, and it’s a shame, because I truly want to sell my customers whatever vehicle best fits their needs, desires and budgets, and so does every other dealer. Wards: You also represent Mitsubishi. That brand has struggled in recent years. Does it have a future, and if so, why and how? Gilchrist: Mitsubishi has a future. They have cut models in the past years, but they’ve got great management, so I think they’re coming back. If they can increase their product lines, then they will have a great future. They make great vehicles. With the backing of Nissan, they can definitely make it. Wards: You started out as a controller at a heavy truck store. Now you run 10 auto dealerships. That’s a big leap. Describe how you took it? Gilchrist: That’s right. You know, I originally went to college to become a lawyer, and instead majored in accounting and became a CPA. I worked for Coopers and Lybrand, a Big Eight CPA firm in Dallas, before I realized I really didn’t like accounting. In 1984, I went to work for a dealer named Kenneth Nichols and in 1986 moved to Weatherford, Texas to run his Ford dealership. In 1986, I became General Manager of Southwest Ford and become a partner with Ken. In 1990, Ken bought Nichols Ford and allowed me to run both stores, and in 1992, I negotiated a buyout of Southwest Ford. In 1993, I negotiated the purchase of the local Toyota-Jeep-Eagle dealership. And in 1995, I purchased the remaining shares from Ken and became 100% owner in both dealerships. Wards: What is your management style? Gilchrist: My management style has evolved. When I first got into business, I thought if I didn't do it, it wouldn’t get done. I was the ultimate micro-manager, because I was taught that if you didn’t open the doors and lock the doors yourself, you wouldn't be successful. My philosophy was I had to outwork everybody. But through the years, as you evolve and grow, you learn you have to give people responsibility. And when you do, you have to give them authority. You have to empower them. When we hire somebody now, that person has to have five core values. You have to have character. You have to have a sense of urgency. You have to pay attention to detail because it’s the little things that make people, our customers, happy. You have to see yourself as part of a team and work on bettering yourself every day. We look for people that have those five core values and then we empower them to succeed from there. Wards: What’s one thing you would do differently as a dealer? Gilchrist: I don’t think there’s anything I’d do differently. We all make mistakes, but we have to learn from those mistakes. And those mistakes, a lot of times, make us better. If you win all the time, you don’t really appreciate what you have. I've been blessed. My life as a car dealer has been unbelievable. People ask me all the time, “What is the best part about being a car dealer?” It’s the relationships you get to make with your customers, with the NADA team, with fellow dealers. Those relationships mean everything. That’s why I don’t think there’s anything I would change. That doesn’t mean I haven't done a lot of things wrong and made a lot of mistakes, but I love what I’m doing.